The Umarex Hammer .50 Caliber Air Rifle. The Umarex Hammer is their new “Air Rifle” that makes you question if that is the right terminology for this beast. Yes it is a rifle, yes it is powered by air, but that is where all similarities to what you think about typical air rifles stop. A 2-round magazine holding .50 cal slugs. The Hammer uses a 24cu carbon fiber tank holding 4,500 psi of compressed gas. Each shot is then regulated at 3,000 psi. What will all that pressure give you? It will move a .50 caliber 550-grain lead slug at 790fps. That translates to 760 foot-pounds of energy at the muzzle. It will also sling a 350 grain at 900fps or a 180-grain ARX Airgun bullet at 1,130fps. This makes for the most powerful production air rifle on the planet. 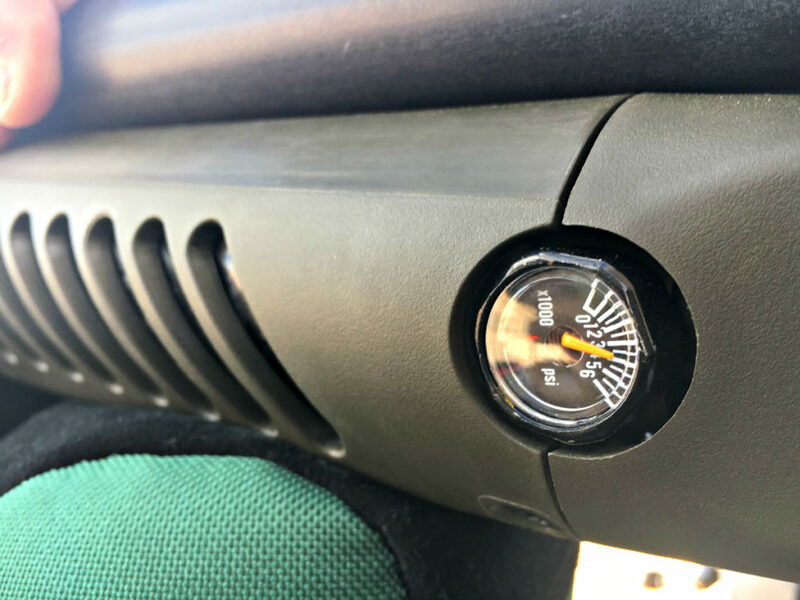 A pressure gauge on the side lets you know how much air is left in the tank. The overall length of the rifle sits at 44 inches. It weighs 8.5lbs. The trigger weight is about 4lbs and it has a safety selector located just above it on the right side of the rifle. The rifle uses a two-round magazine coupled with a straight pull bolt requiring only 2lbs. of force and 2 inches of movement. The Hammer has a MSRP of $799. You can, of course, use pressurized tanks to fill the gun tank, but that might not always be available. So you can actually use a hand pump to fill the tank, should you be out in the field or somewhere where a larger air tank isn’t available. 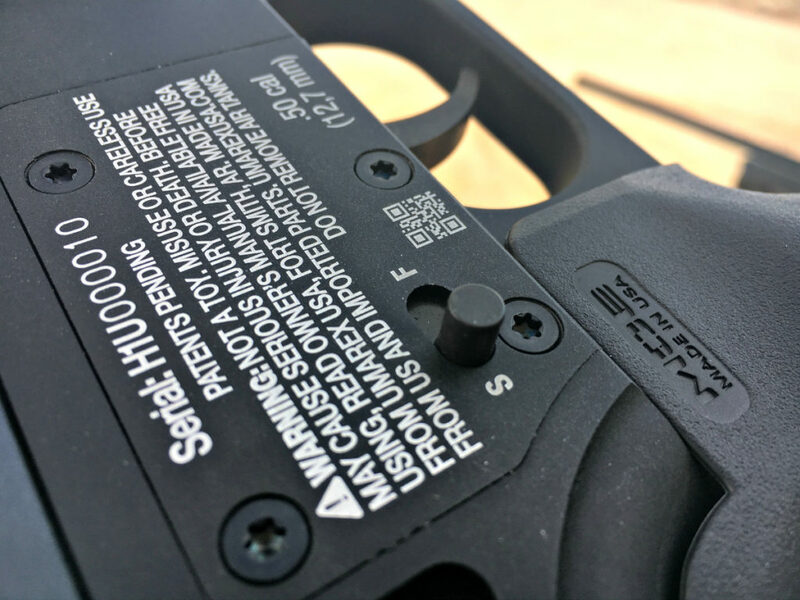 The safety selector is located on the right side of the rifle. How does it shoot? 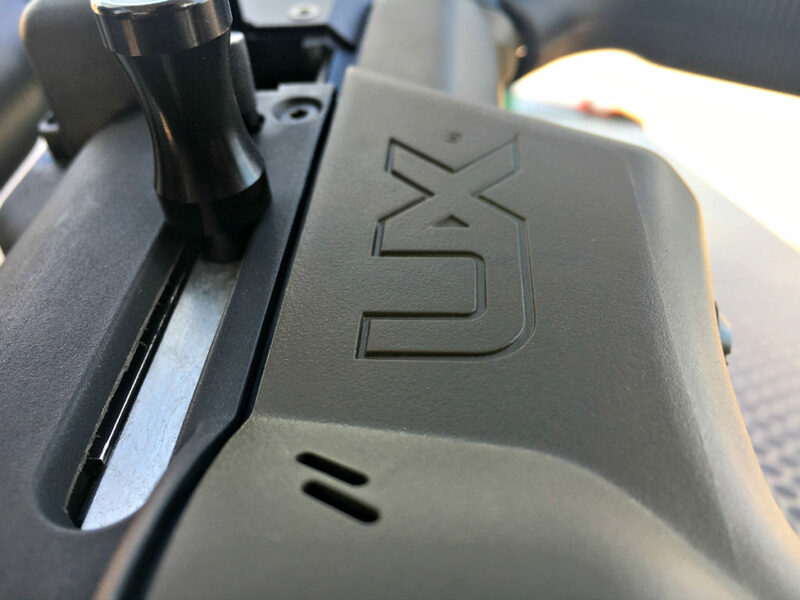 Umarex claims it will put 3 rounds touching at 50 yards. Out at the SHOT Show 2019 Range Day I didn’t have the chance to shoot groups, but I did put a couple rounds through it. It recoils more than your Red Ryder, that is for sure. It is pleasant to shoot though. The recoil isn’t snappy at all, more of a slightly prolonged push. 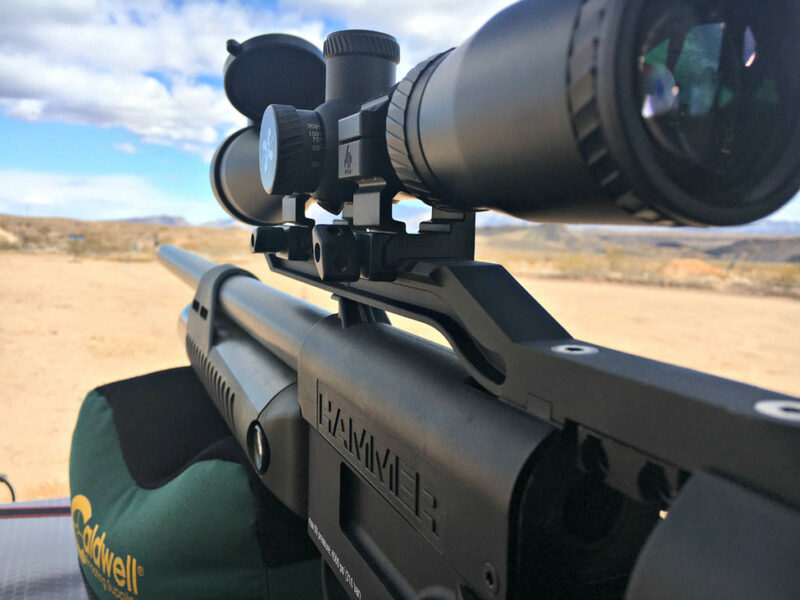 If you are looking for the most powerful production air rifle, capable of taking most any game, check out the Umarex Hammer. The straight pull bolt only travels 2 inches and requires 2lbs of force to manipulate. I have noticed in a few of the videos I’ve seen the Hammer previewed in it had a forearm pump action with a 3 round mag and now everywhere I’ve looked to purchase it only offers it in 2 round with a bolt action. Is it available in pump action like was said and shown in the umarex review videos? I think you mean “American Bison” and not cape buffalo. Big difference. Actually, Cape buffalo have been taken already with airguns a lot less powerful than this one, such as the Air Force Texan. And the Hammer has, I believe, already been used to take Cape buffalo as well. Provided I did my work properly the only game on earth I’d have misgivings about hunting with the Hammer are rhino, hippo, and (above all) elephant. Having said that, the Hammer could probably bring down even those three with a properly placed shot. Whether the animal would expire before stomping you into a bloody mudhole is another question altogether. Powerful the Hammer may be, but for a charging elephant there’s just no substitute for a .600 Nitro Express rifle. Disclaimer: I have no actual desire to hunt any of the above named animals. I think trophy hunting is despicable, particularly when it comes to threatened or endangered species. Such as all of the so-called Big Five of African hunting. I would like to see how this stacks up against the Airforce Texan air rifle. Very cool! I love the innovation and those are serious numbers. Basically an air-musket with ballistics like that, and basically shooting a Minie ball to boot! I find air rifle to be a lot of fun. I can enjoy quality trigger time without bothering the neighbors and squirrel hunting with one takes the anxiety down a notch because I know the pellet is going to loose energy fast and thus not travel a “mile” like a .22. I think we need another gauge than FPE. We’ve been taught that one needed 900 FPE upon impact minimum for deer but these guns are regularly found to produce complete pass-throughs with far less FPE. In fact two air rifles that produce the same FPE, one with a faster lighter pellet and the other with a heavier slower pellet one see’s the heavier one will penetrate further. Momentum or inertia (I’m no physicist) has to be factored into the equation I’m thinking. Air rifles have killed Cape Buffalo, a complete pass through on American bison, all with FPE that says the job can’t get done. This is much like the old buffalo hunters being able to kill buffalos at hundred’s of yards with slow heavy bullets that often attained complete pass-throughs. There is a measurement in the FPE equation that is missing. These High Powered Air Rifles continue to get better and better, and more High Priced! Until pricing becomes affordable for the everyday citizen they will only be exotics for the few. Umarex, lower your pricing and go for sales volume. Your profits will far exceed the paltry few you currently sell. I’ve gotten into air gunning over the past couple of years. First as back yard pest management with cheap break barrel, then lately into PCP rifles. When you consider the price, think of the equivalent cost of a .50 cal powder burner with the cost of an NFA suppressor on the end of it to bring noise level down to what this rifle produces. In the long run, your .50 cal cartridges will keep adding to the cost of operation, eventually bringing it to the cost of this rifle. So, while the initial cash outlay is higher, in the long run, they become more affordable due to lower cost of ammo. These rifles have extra parts and seals designed for high pressure that add to the cost to produce. Also, these airguns are not BATF regulated and convicted felons can buy one to hunt with. Not as cut and dry on the price difference as it would initially seem. Given the prices of most premium airguns–and any airgun that can make the kind of numbers this one can is a premium airgun–at $800 the Hammer is a virtual steal. The less-powerful single-shot Texan is several hundred dollars more. If Umarex priced the Hammer well up into the one-thousands it would still be a good deal as compared to other rifles in its class. Literally, the only way to get a more powerful air gun is through a custom builder like Extreme Big Bore Air Rifles, who literally build the most powerful airguns on the planet. For about four or five times the cost of the Hammer. 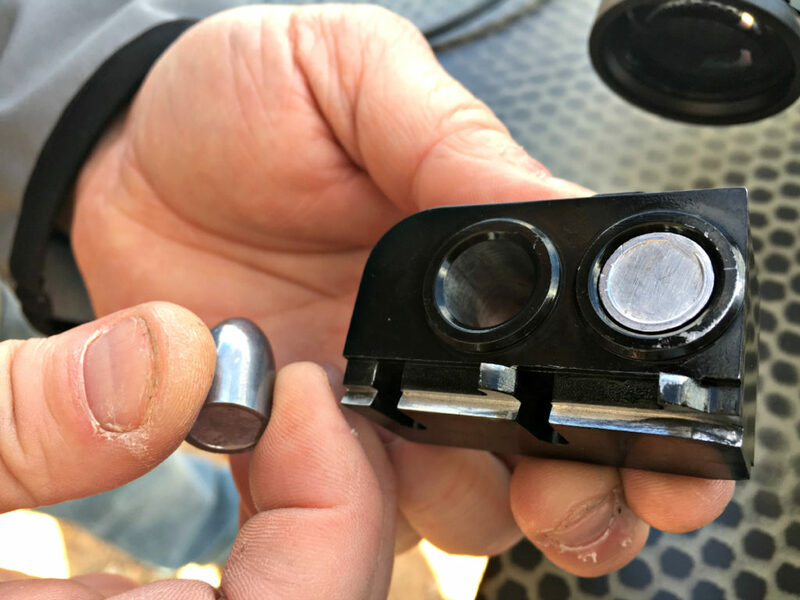 Keep in mind that hugely powerful hunting airguns are something of a niche market and thus aren’t necessarily marketed to the everyday hunter who could indeed get a damn fine powder-burner for the same cost. Those of us who obsess over and spend money on these air powered cannons have our own reasons, be they legal issues or simply hobby preference. I watched the video and it looks like the barrel is not threaded. I realize the shooter was wearing hearing protection, they were also surrounded by rifle fire, so what is the decibel reading? Overall looks nice. I like the entire idea and the price is good. It does not look as though it has a threaded barrel. Can I run it without hearing protection?